Most people believe fixed deposits to be the safest investment possible as its value never go down, there is no perceived risk of bank defaulting on payments and you can do FD online just on click of few buttons. 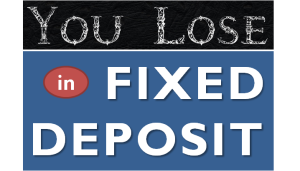 How you lose Money by investing in Fixed Deposits? But have you realized that investing in fixed deposit might be making some of you poorer. I am not kidding. I would throw you some numbers to prove my point. But as with any financial calculation, here are some assumptions. We take inflation as 7.5% per annum. In case you are not aware of inflation, it means that @ 7.5%, a product which was available for Rs. 100 last year, it now costs Rs. 107.5 i.e. 7.5% expensive than last year. The table below shows the annual post tax return and inflation adjusted return for FD with interest rates of 8.75%, 9.00%, 9.5% and 10%. Also Read: The Best FD Rates for General Public and Senior Citizens! How you Loose Money in FD! The cells where inflation adjusted return comes out negative is shaded in red. These are people who are losing money year on year on Fixed Deposits due to inflation and higher taxes payout. For e.g. if you are in 30% tax bracket, you need to invest in an FD offering at least 10% to get positive inflation adjusted return. I am not sure how many of you knew the above fact but conveniently ignored it, but if you are looking for alternatives to FD, here are some options. Debt Funds – if you invest in debt funds the returns might be similar to fixed deposits but the tax treatment is different. In case you redeem debt funds after three year, the gains are treated as long term capital gains and taxed accordingly. For less than 3 years the gains are treated as short term capital gains and the taxation is similar to that of FD. You can get more details on Parking Short Term Money – Bank Fixed Deposit or Liquid Fund or Savings bank Account? FMPs (Fixed Maturity Plans) – FMPs are close ended debt mutual funds. These are of varying tenures like three months, six months, one and two years and rarely for three years. These schemes portfolio consists of debt securities such as Government Securities, certificate of deposit and commercial papers of nearly the same maturity as the scheme. The returns are similar to FDs but they receive favorable tax treatment (for investment of more than 3 years) and suits people in higher tax bracket. Total interest for the financial year in savings bank account is less than Rs 10,000. The strategy works because budget 2012 introduced a new section 80TTA, according to which interest up to Rs 10,000 in savings bank account for a financial year is tax free. Corporate/ NBFC Deposits – I keep writing about fixed deposit schemes from corporate and NBFCs. These generally offer higher interest rates than bank FDs and hence make sense to invest with them. But you must understand that the higher return is due to higher risk that you take while investing in these deposits. You should only invest in reputed corporate, government backed companies or AA and better rated NBFCs, Corporate deposits. PPF (Public Provident Fund) – Its offering 8.8% interest and the best part it gives 80C benefit of saving and tax and the interest earned on PPF is also tax free. So your return would stay above inflation most of the time. EPF/VPF – EPF/VPF is offering 8.5% interest rates. This too like PPF is a tax saving instrument as per Sec 80C and the interest earned in not taxed. Tax Free Bonds – These bonds are offering tax free interest rates of 7.38% to 7.69% (for retail investors) depending on tenure. If you compare these interest rates with the FD post tax returns in the table above, you would find it makes definite sense for people in 30% tax slab to invest in tax free bonds. Also there is opportunity for people in 20% tax bracket to invest in Tax Free Bonds if they cannot find FDs paying more than 9%. The good news as per Budget 2015 is there would be more offers for Tax free bonds in the next financial year too but the interest rates might come down. Click here to check Tax Free Bonds open for subscription. Sir I just want to know that I want to do FD of Rs 15 lakh but after demonetization is there any such problem. Demonetization does not impact FD anyway except that it lead to lowering of interest rates a bit! If we can put so much effort in earning money, we should put some effort to manage it too. If you invest in liquid/short term debt funds risk is very low and you gain on taxation if redeemed after 3 years. can send me your contact number. Thanks for all these eye opening facts about fd. But still I want to know more about debt fund.how it opens .and its benefits. The process to invest in Debt Fund is same as normal Mutual fund. You can read more about investing in Mutual fund here. Debt funds are more tax efficient especially for duration of more than 3 years. As the inflation comes down so does the interest rates offered on bank fixed deposits, so you would not really make money in FDs. The best that can happen is very marginal returns over inflation and after taking tax in picture even that is difficult. For regular income – Senior Citizens’ Savings Scheme is a good option. Other than this you can invest in Debt Mutual Funds which is more tax efficient. But for long term you have to invest in equities directly or through mutual funds to beat inflation. So putting a part of portfolio which is going to be used after 10 years, its good idea to go with equities. Good article Amit. Investors generally tend to see the FD rates and does not compare what they are getting above inflation rate. Such comparison helps in realising how we are loosing money. I knew that FD is not the best of investment but didn’t realize I was loosing money. This is an eye opener for me. Thanks you like it! So where are you going to invest if not FD? But what about 5-year FD? is that also disadvantegous? In most cases inflation is higher than fixed deposit returns after tax. So you would loose money irrespective of FD tenure.